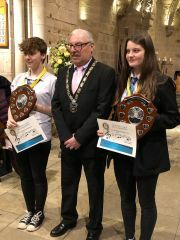 "Last night, Monday 14 January 2019, we held our annual Rotary Young Musician of the Year Competition. It was held in the beautiful venue of Dalmeny Kirk, and was well attended. We had a total of 10 performers, who all put on a fantastic concert for their audience, and gave our two judges a very difficult job to do! If you see any of the following pupils, please congratulate them, particularly those who achieved a place and a medal. The winners of each category will go through to the next round held at Heriot Watt University, where they will compete against pupils from other schools. Please wish them all the best. If you are able to pop along to Heriot Watt on Wednesday 6th February, we’d love to see you there to support our brilliant young musicians."